As managers of an industrial or commercial facility, it is important that you play your role in protecting and preserving the company’s assets. Company assets, such as carpets, flooring, and upholstery are prone to wear and tear. A huge investment goes into procuring carpets, especially if the rooms are large and a significant square footage of the floor needs to be covered. Similarly, the cost of the industrial flooring is also high. When it comes to the office upholstery, the investment cost is dependent upon the material of the upholstery. Regular maintenance plans should be developed and cleaning jobs must be performed in a timely and economical way. If you do not take care of the company assets then chances are that carpets, upholstery, and flooring will not meet the life expectancy. Read on to how a professional cleaning company will help in asset protection. High-end office carpets are extremely expensive. Therefore, it is mandatory that you keep them clean and tidy or else they will soon lose their softness and aesthetic appeal. There are several ways through which you can boost the appearance of the office carpets, making them look new and refreshed even after years. Vacuuming regularly sure helps in maintain the carpet but if you want to extend its longevity, you will have to acquire the services of trained technicians. Pile lifting, hot water extraction, and deep cleaning are some of the ways that a professional carpet cleaning company can help you with. Office upholstery is one of the first things that a person notices upon entering. If you do not take care of the upholstery, then the damage will result in unforeseen expenses. You wouldn’t want to replace the upholstery often because it is unable to get cleaned because of the excessive stains and grime. Upholster is a company asset that is essential for boosting your brand image. Regular maintenance and professional cleaning will ensure that the upholstery retains its durability throughout its lifetime. Industrial floors are under a constant threat of staining from spillages. Additionally, greasy and oily spillages or leakages apart from arousing a threat of slippage have an affect over the appearance of the warehouse floor. The floors of the manufacturing or distribution facility are a company asset and you should take measure for protecting their functionality and aesthetic appeal. Industrial flooring is different from normal flooring. Therefore, they require specialized cleaning solutions. A professional cleaning company can clean the floors where food materials, medical supplies, and other sensitive supplies or equipment is kept. Extra Hands Services offers a wide range of services that will ensure that the company assets can serve you for a long time. 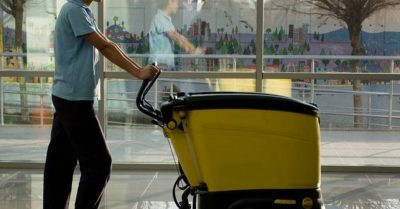 We provide cleaning services for office upholstery, commercial carpets, warehouse and distribution facilities, medical equipment, hospitals, and factories. Our technician will make sure that you are able to maintain clean room environments. Call us at 816-396-6234 to find out more about our customized solutions for various different kinds of commercial venues.